Adam and Katarzyna Ślesickis and their programme DOC LAB POLAND received the prestigious European Documentary Network award. During this year's Docs in Thessaloniki, on March 6th, DOC LAB POLAND, a special programme for development and support of documentary films, and its creators Adam Ślesicki and Katarzyna Ślesicka were honoured with the EDN - European Documentary Network award in recognition of their outstanding contribution to the development of the European documentary culture. It is the first time that the award is given to the Polish initiative. In the previous years the EDN award was received by, among others, European documentary guru Tue Steem Müller, Stefano Tealdi and Joan Gonzales for creating Documentary in Europe and DocsBarcelona, Nenad Puhovski for Zagreb Dox, Institute of Documentary Film in Prague, IRDFA - Iranian Documentary Film Association and Diana El Jeiroudi and Orwa Nyrabia - the founders of DOX BOX in Syria. European Documentary Network, established in 1996, is an international organisation for film industry professionals and documentary institutions: filmmakers, producers, production companies, distributors, associations, film institutions & boards, universities, festivals, broadcasters and film & television agencies. The organization has around 1000 members from more than 60 countries. EDN is organising a number of activities including pitching sessions, development programmes, seminars and workshops. It also publishes annually the EDN Co-Production Guide – indispensable resource for documentary production. It is one of the world's leading institution supporting documentary cinema. The EDN award was founded in 2005. - Thank you for this award. I dedicate it to all filmmakers that submitted their projects to us. We receive this honour thanks to their hard work during workshops and pitching sessions. I also have to emphasize that DOC LAB POLAND can be organised on such a large scale due to the cooperation with our main partner, Krakow Film Festival - said Adam Ślesicki, while receiving the EDN award at Docs in Thessaloniki. 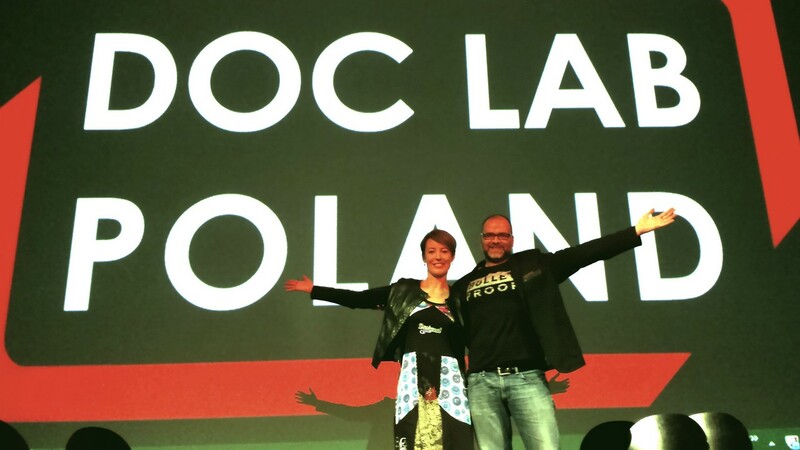 Adam and Katarzyna Ślesickis initiated DOC LAB POLAND in 2015 as the first programme of Władysław Ślesicki Film Foundation, also funded by the couple. Currently it is the largest and most multi-faceted program for documentary filmmakers organized in Poland for Polish projects, supporting auteur, creative documentary filmmaking while focusing on the production aspect. It features an annual comprehensive program for the development of film projects, based on workshops, individual consultations and panel discussions, as well as a workshop leading to the pitching. DOC LAB POLAND is also a platform for presentation of those projects to the leading Polish and world experts, producers, distributors and festival representatives giving the opportunity for individual meetings with them. Another important component is an International Co-Production Market offering meetings among international producers, professional exchange and a chance to find partners for film production. Pitching sessions and Market are organised together with Krakow Film Festival. Another element is a series of open screenings DOC HOT SELECTION aimed at promotion of Polish documentaries as well as lectures on filming technique. DOC LAB POLAND is organised in cooperation with: Monika Zarzycka, Aleksandra Różdżyńska, Anna Zajączkowska and Edyta Borkowska. DOC LAB POLAND brings together the best traditions of Polish documentary film school with an international approach, in cooperation with the best Polish filmmakers and foreign experts. The main objective of the program is to enhance the artistic value of the selected projects, while increasing their festival and distribution potential. The long-term objective of the DOC LAB program is to promote the art of documentary film among viewers in Polish cinemas and introduction of full-length documentaries into cinemas as well as their more frequent presence in TV and on Internet channels, and finally to promote Polish documentary film abroad. Every year over 20 projects, represented by around 40 filmmakers and producers (workshops and pitching sessions), and around 40 more producers at Co-Production Market take part in the programme. The third edition of the programme, organised in 2017, consisted of over 700 individual meetings. In total it took 20 days of workshops at three sessions (Warsaw, Krakow, Warsaw), lead by 25 lecturers and tutors. Apart from the producers, the meetings were attended by over 30 decision-makers: sales agents, festival programmers, TV and fund representatives, etc. Around 120 additional guests participated in 4 open lectures (apart from those attending the workshops). The 6 film screenings gathered around 400 people. Currently the fourth edition of DOC LAB POLAND is being prepared. Most of the Polish documentary films that have recently won awards abroad had taken part in our workshops or START or GO! pitching sessions: from "The Prince and the Dybbuk", "Communion", "The Uggliest Car", "Call Me Tony", "Volte", to "Miss Holocaust" and "21 x New York". This year five out of six Polish films at the most important European documentary festival IDFA, and for three years in a row all projects at DOK Leipzig Market – are the projects from DOC LAB POLAND. The programme's most important partner is Krakow Film Festival. Krakow pitching sessions are organised as a part of KFF Industry, in cooperation with Head of KFF Industry Katarzyna Wilk. DOCS TO GO! presentation has been organised since 2012 by PISF and Krakow Film Foundation, and since 2015 in cooperation with DOC LAB POLAND. On behalf of PISF it is organised by Kinga Gałuszka and Marta Sikorska. The organizer of DOC LAB POLAND is Władysław Ślesicki Film Foundation, and its main partner is Krakow Film Festival. The programme is also supported by DOK Leipzig, the most important documentary film festival in Germany, EDN - European Documentary Network, Institute of Documentary Film in Prague and Warsaw Film Festival. Partners of the 2017 edition were: the Ministry of Culture and National Heritage, Adam Mickiewicz Institute and Culture.pl, the Foundation for Polish-German Cooperation, Polish Film Institute, the Municipal Office of the Capital City of Warsaw, Marshal of Malopolska Region, HBO Europe, Creative Europe Desk Poland, Mazovia Warsaw Film Commission and the Mazovia Institute of Culture, Krakow Festival Office and Krakow Film Commission, Krakow Technology Park, Krakow Film Cluster, Law Offices of MKZ Partnerzy and the Polish Audiovisual Producers Chamber of Commerce. Media partners: Film Pro, Film & TV Kamera, Co Jest Grane 24, Polish Docs and TVP Kultura.